Savannah, Georgia-based OnPoint Digital, Inc. won a prestigious industry award at the CTIA WIRELESS 2008® Conference held this week in Las Vegas, Nevada. OnPoint Digital's winning entry in the Emerging Technology ("E-Tech") Awards program, titled the "CTIA Wireless CellCast Site," was developed using the company's new CellCast Solution platform that allows organizations to create, distribute and track audio and message-based content with integrated tests and surveys to any mobile phone. The award was presented to OnPoint Digital cofounders Katherine Guest and Robert Gadd at a ceremony held during the event at the Las Vegas Convention Center. The E-Tech Awards program gives industry recognition and acknowledges the best wireless products and services in the areas of Mobile CE (consumer electronics); Consumer Mobile Applications; Enterprise Solutions; Network Infrastructure; Mobile Widgets; and 4G. The CTIA WIRELESS 2008® Conference, one of the industry's largest global gatherings, had more than 1,100 exhibitors and 40,000 attendees from 125 countries. "We are thrilled to be recognized by CTIA and their esteemed panel of judges for our CellCast Solution," said Katherine Guest, Vice President of Sales & Marketing for OnPoint Digital. "This recognition is significant since each entry was evaluated on 'innovation, functionality, wow factor, importance of technology and ease of use and implementation' according to contest guidelines." "The CTIA Emerging Technology Awards recognize the best wireless products and services in the industry," said CTIA vice president and show director Robert Mesirow. "Congratulations to OnPoint Digital for winning first place in the CTIA Mobile Widget Contest." "This year, CTIA WIRELESS challenged all wireless industry developers to create a unique and innovative mobile widget for the show, and we responded with an innovative solution that will work seamlessly to support every attendee at the upcoming CTIA Innovations Show to be held at the Moscone Center in San Francisco, California in September 2008," said Robert Gadd, president of OnPoint Digital. "This award represents a major opportunity for our company and technology as our CellCast Solution will be used to support and inform thousands of wireless industry professionals at CTIA's next international gathering." OnPoint Digital, Inc. is a technology software and services provider dedicated to the development of powerful yet affordably priced online and mobile content and communications solutions for middle market and enterprise customers. OnPoint's innovative new CellCast Solution allows companies to easily create, deliver and track audio and message-based content with integrated tests and surveys directly to users' mobile phones, minimizing device-specific constraints and deployment costs associated with other mobile solutions. "CellCasts" are simple to create, easily repurposed, and ideal for just-in-time communications, product training, learning reinforcement and field data collection. In addition to CellCast, OnPoint offers an enterprise class Learning Management System platform enabling the creation and management of rich-media courseware, online assessments, appraisals, skills tracking and detailed reporting, plus numerous optional modules such as document management, e-commerce, portal/intranet and advanced mobile learning offerings. For more information about OnPoint or our CellCast Solution, visit our websites at http://www.onpointdigital.com or http://www.mlearning.com. As the premier global event representing the $500 billion global wireless industry and the largest wireless show in the world, International CTIA WIRELESS 2008 brings together all industries affected by wireless technology for three days of intense learning and networking. Visit http://www.ctia.org/ctiawireless. CTIA-The Wireless Association™ is the international association for the wireless telecommunications industry, representing carriers, manufacturers and wireless Internet providers. 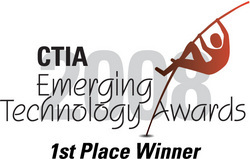 CTIA is also recognized as the premiere producer of two annual technology events representing the complete wireless, mobile and Internet industries: CTIA WIRELESS 2008 takes place in Las Vegas April 1-3; CTIA WIRELESS I.T. & Entertainment 2008 takes place in San Francisco September 10-12. Visit http://www.ctia.org. CTIA WIRELESS 2008 is a registered trademark of CTIA Wireless.